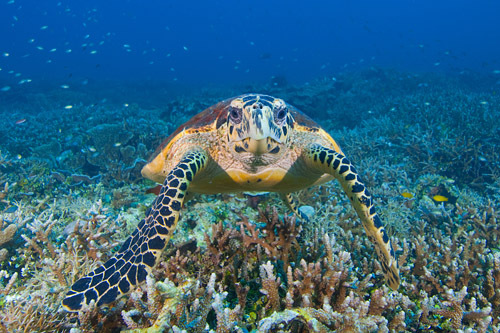 The Turtle Island Park lies 40km north of Sandakan in the Sulu Sea. A safe haven for the endangered green and hawksbill turtles visitors have the rare opportunity to watch turtle landings. 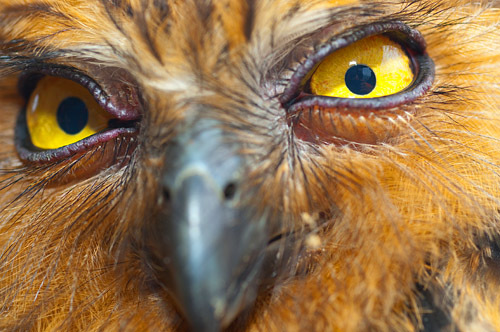 The Kinabatangan River is home to some of the most varied and easily accessible wildlife in all of South East Asia. Rising from the eastern Witta Range of Sabah, the Kinabatangan River begins its 350 mile north-easterly course towards the Sulu Sea. 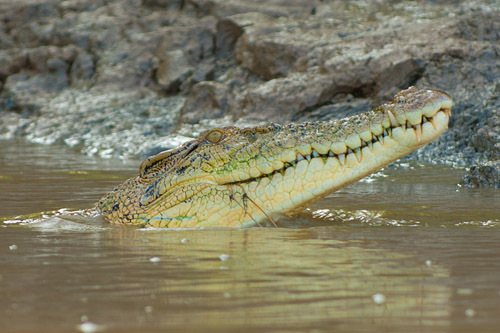 Early morning and late afternoon rivers cruises are the best way to enjoy the river and encounter wildlife. Our 4D3N Turtle Island & Kinabatangan River include one night stay on Turtle Island, two nights stay along the Kinabatangan River enjoying river safaris and jungle walks. 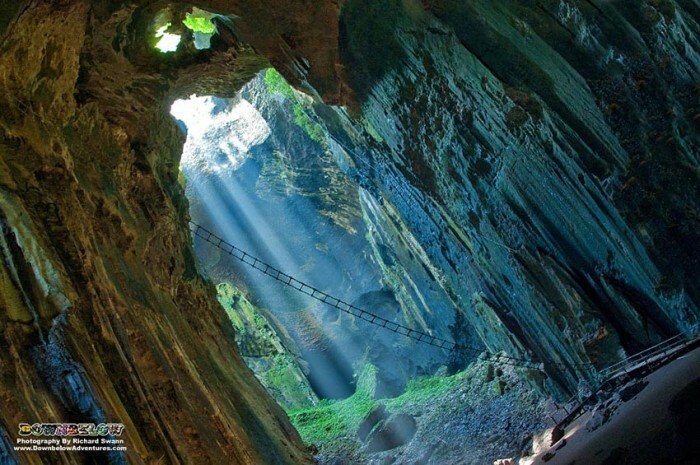 Plus an optional visit to Sepilok Rehabilitation Centre & Gomantong Caves. Shorter stays are also possible since all our packages can be tailored. Ex-Sandakan Selingan – fondly known as Turtle Island is the largest of the islands and houses the park’s headquarters, a turtle hatchery, tourist accommodation and basic facilities. Bakungan Kecil and Gulisan island are dedicated conservation locations. 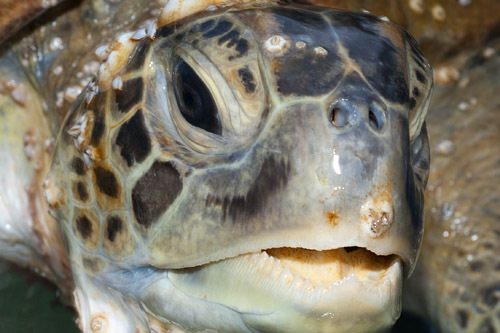 As turtle landings usually occur after dusk, an overnight stay is required. 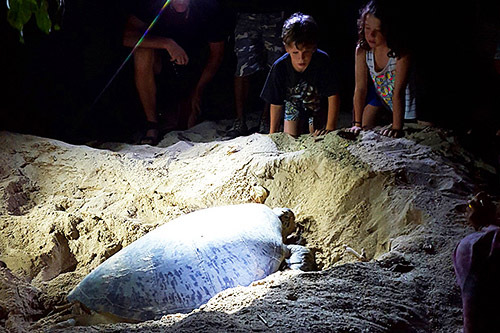 Turtles come ashore to lay their eggs and guests are invited to quietly observe. The park rangers closely manage the event and prohibit the use of torch lights and camera flashes to avoid stress for the creatures. Turtles lay their eggs throughout the year, but the best time to visit is between July and October when the sea is calmer. 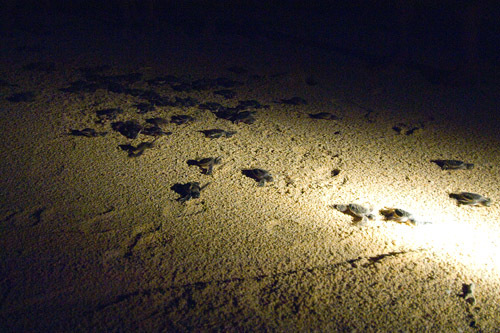 Observe the collection of eggs, tagging of mother turtles and releasing of baby turtles into the sea. 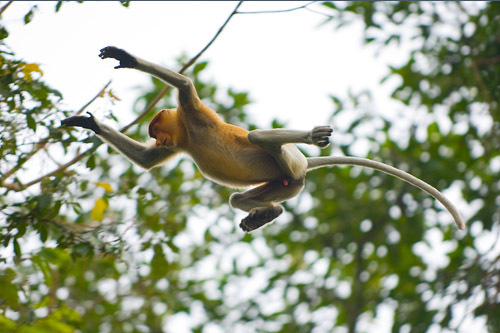 The Kinabatangan is Sabah’s longest river and the second longest in the whole of Malaysia. Approximately 20 oxbow lakes form part of the lower regions of the river. Created over time and separated from the main river as erosion and deposits of soil changed the river’s course, oxbow lakes are paradise for bird watchers and wildlife enthusiasts. River People, or Orang Sungei, live in small settlements spread out along the river. It’s fascinating to see their self sufficient, peaceful homes fully operational, making a living through fishing the lakes and rivers and farming vegetables on its banks. 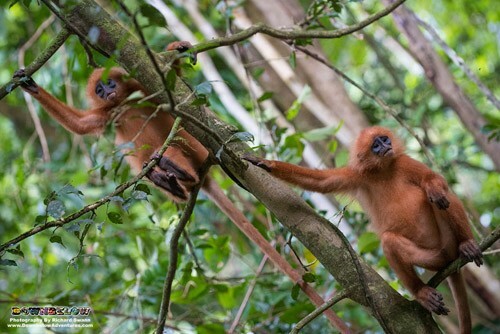 They use the forests of the Kinabatangan as a source of building material, firewood food and medicine. Most of the wildlife lodges are concentrated around the Sukau area, which is very accessible and offers a wide range of facilities. We prefer to travel slightly off the beaten track and found some wonderful lodges located in Kampung Bilit, a tiny village with about 150 inhabitants. For this 4D3N Turtle Island & Kinabatangan River we use two different lodges depending on availability. The lodges offer very comfortable and clean accommodation, its quiet with very little disturbance made to the surrounding forest and unlike Sukau you don’t have lodge after lodge along the river-bank. 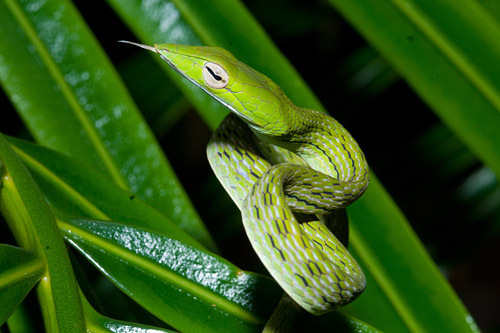 The staff at the lodges are mostly from Kampung Bilit and the guides are extremely knowledgeable about the local wildlife, plants and medicine, always ensuring that you are well informed on the diverse ecosystem that surrounds you. Day 1 – You will be picked up, from either Sandakan airport or from your accommodation in Sandakan town, to be transferred to the Crystal Quest Jetty. From there you will have a 75 minute (approx.) boat ride to reach Selingan Turtle Island. Check-in to your chalet at the resort, and adjourn to lunch. After lunch, you are free at your leisure to explore the islands beaches, swim in the sea, or snorkel (equipment can be rented from the rest, and is at your own expense). After dinner in the cafeteria, the park rangers will call guests when there is a turtle laying eggs on the beach. You can see the process of collecting the turtle eggs, how the hatchery incubates the eggs, and release of turtle hatchlings into the wild! Day 2 – Breakfast in the cafeteria is at 06:30, before the boat transfer at 07:00 to return to Sandakan. Upon arrival, a minivan will transfer you to Sepilok Orang Utan Rehabilitation Centre. 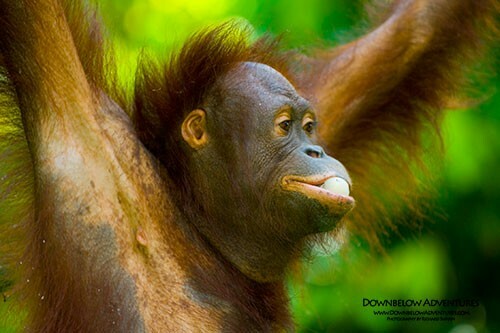 At the information centre, watch the enlightening documentary on the conservation efforts to reintroduce the orphaned orang utan into their natural jungle habitat, and proceed to the feeding platform to witness them. After, you will transfer to the Kinabatangan River and check in at your chosen accommodation. You are free at leisure after lunch (Jungle walk around the lodge might apply – your guide will discuss with you on how your day are). At 16:00, a river cruise is scheduled for you to join and search for wildlife before the sun sets. Back to the lodge for dinner, and overnight for an early start the next morning! 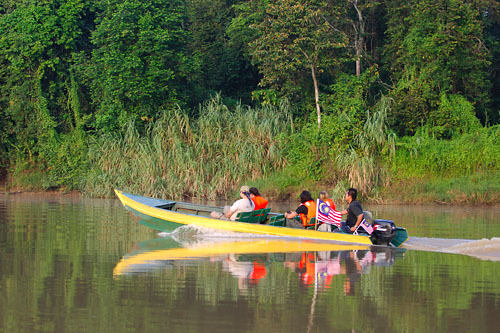 The morning river cruise starts early, at 06:00, to spot more wildlife along the Kinabatangan River. Breakfast is served when returning to the lodge. If you are staying at the standard accommodation – you will trek to the Oxbow Lakes. If you are staying at the standard plus accommodation – you will enjoy a jungle walk (2000m) around the resort. Another river cruise is scheduled at 16:00 for another chance to spot more wildlife. Day 4 – After breakfast at the lodge, check out and visit Gomantong Cave. After cave, return to Sandakan town for lunch. After lunch, transfer to your departure point. At all times during this 4D3N Turtle Island & Kinabatangan River trip, you are in safe hands. We take our responsibility as a travel agent very seriously and have a number of verifications in place to ensure that we are offering quality locations to our clients and describing them honestly. • Unlimited coffee and tea. Due to weather conditions, activities may be subject to re-scheduling to best meet operations, as well as clients health and safety. 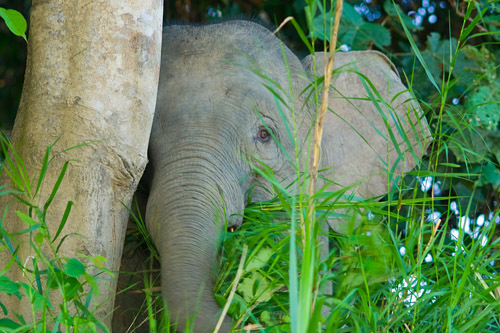 Wildlife cannot be predicated nor guaranteed because it is a spontaneous chance to spot any in their natural rainforest habitat.